Nickname: “Hoosier State” came into general usage in the 1830s. John Finley of Richmond wrote a poem, "The Hoosier's Nest," which was used as the "Carrier's Address" of the Indianapolis Journal, Jan. 1, 1833. It was widely copied throughout the country and even abroad. 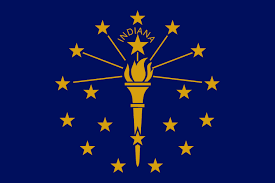 A few days later, on January 8, 1833, at the Jackson Day dinner at Indianapolis, John W. Davis offered "The Hoosier State of Indiana" as a toast. And in August, former Indiana governor James B. Ray announced that he intended to publish a newspaper, The Hoosier, at Greencastle, Indiana. I was doing a project near Gary and kept passing this building. 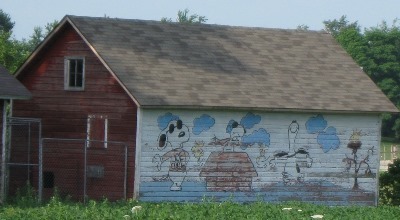 It was a tough project, so I looked forward to the Snoopy Barn as I was calling it.